Hanoi in your imagination may be quite alluring, dynamic and it’s also rush in the stuffy atmosphere, noisy with full of buzz vehicle horn. From other aspects, there has another Hanoi without congestion, no noise, and no fume that is Hanoi at night. 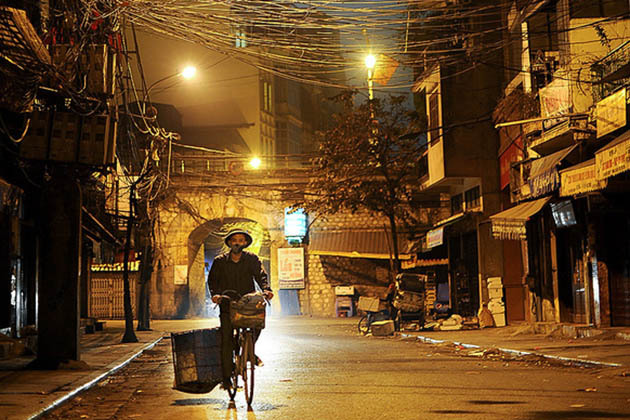 If daytime makes visitors have not enough time to stop and look at the antique beauty of 36 streets in a city with thousand years of civilization, nighttime in Hanoi is the right time for the unforgettable experience in your holiday. 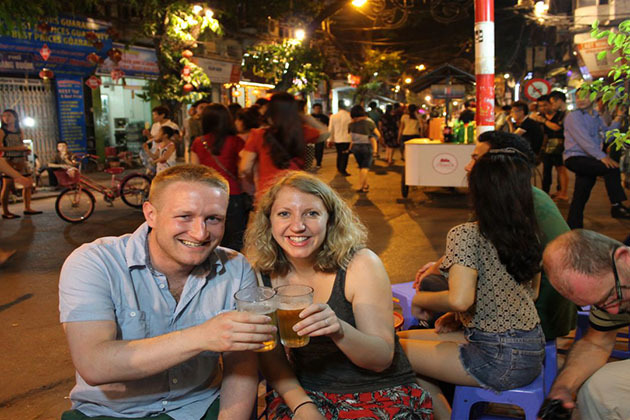 Follow Hanoi Local tour to catch another Hanoi Vietnam nightlife! Differ from Hanoi with the bustling pace of life, the afternoon traffic jam with fume and noisy vehicle horn, Hanoi at night wears a mysterious but not less magnificent gorgeousness. You can relish in the bustling but appealing nightlife in Hanoi following the Western style at the renowned pub house. On the other aspect, take a chance to delve into a casual Hanoi, when the night falls, the street lights up, and Hanoi turns into night. All roads and streets are twinkles with sparkling lights which make Hanoi more shimmering and brilliant. On some old streets such as Hang Ngang, Hang Dao, Hang Ma, Luong Van Can, the crowds walk around and come in some souvenir stores and just enjoy the ancient space of Hanoi. 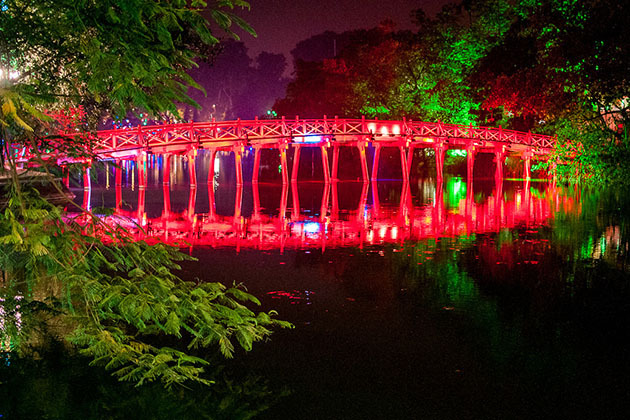 On the roads like Thanh Nien, Quang Trung, Nguyen Du, around the West Lake, Truc Bach Lake, Sword Lake, the young people come here to relax, enjoy the cool and admire the natural beauty at night. In late night, the electric light from the small alley shines through the night, the array of houses stay silent and you can feel the soothing sound of falling dewdrops on each leave. Lost in that quiet space, somewhere, sounds of insects appear, and the voice of the people selling goods at night. From a far distance, you can hear the sound of broom sweeper echoes of night sanitation workers. Hanoi never stops working even at night, on all roads, bicycles, motorcycles, and cars are moving. In the wholesale market, the voice of buying and selling human makes the market become busy and bustle. The most brilliant and romantic scene is in Quang Ba flower market at night. Regardless sweltering summer night or bitter winter night, the flower market is still colorful. 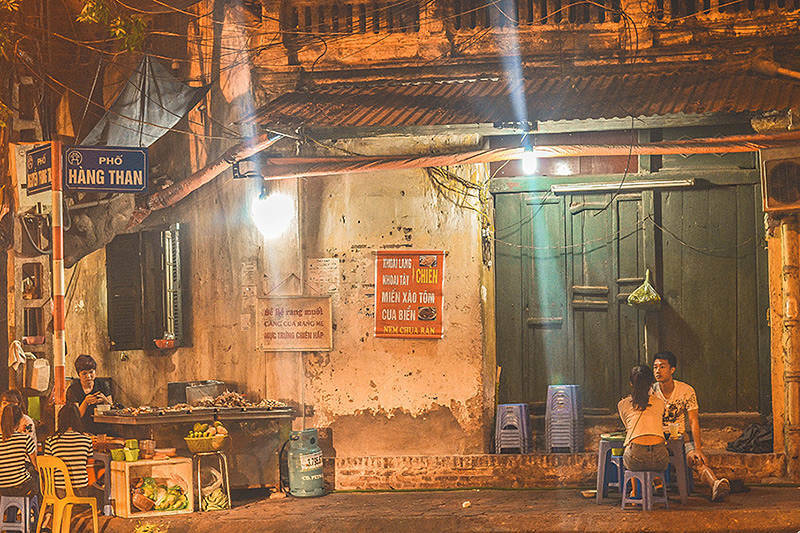 Hanoi nightlife is the night of the sparkling lights, the rhythm of noisy streets, and the ordinary man struggling for living life. 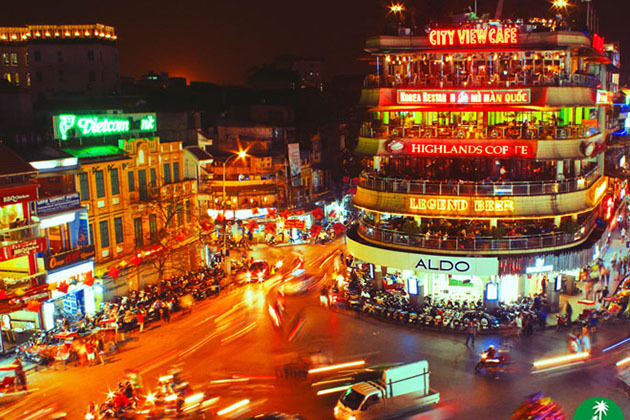 Nightlife in Hanoi is the cultural values lasting from time to time. Ta Hien Street is the first recommendation for you, it’s situated in the center of Hanoi Old Quarter, also called Bia Hoi corner where is an absolute classic nighttime attraction in Hanoi. The beer in here is rather light in compared with European criteria, absolutely worth trying. Hanoi street food is also a characteristic of Hanoi at night, and that is why Hanoi is considered one of the world’s most perfect night street food. From the ancient streets to new paths, they all have the food stores open from the early to late at night, from the soothing flavor of boiled corn, the roasted sweet potatoes, tasty bowl of chicken soup to the famous dish in Hanoi capital, rice noodles soup. Interestingly, even it’s 1 or 2 o’clock in the morning, you can still enjoy these superb delicacies on overnight Hanoi streets. A favorite place to satisfy your needs from fun to dining around the lake. Especially, as the night slowly falls, you can choose a small corner around the lake to chat with friends, enjoy the savory dishes here like shrimp cake, West lake ice-cream, or iced tea. Top of Hanoi is definitely the highest bar and coffee in Hanoi, where you can see Hanoi behind. Lotte Center Building, the second tallest building in Hanoi, has a large terraced and extended section of the balcony making an open space for watching the entire beauty of Hanoi. + When going out at night by motorbike, remember to fill up it with energy because it’s hard to find a gas station if you’re not a native. + You should not go out alone to keep yourself safe as in some case you might come up against robberies or drug addicts. + Remember to bring your identification.